Casa Armonia is a unique house situated between the vineyards of La Mola. This complete hideaway is perfect for those wanting a peaceful holiday away from every day stresses. Enjoy privacy in a luxurious environment with all the modern comforts. Freshly decorated and designed with elegance, the quality of the fittings and furnishings in the house are excellent. Passion and thought have clearly gone into this project to make a dream come true. Located between vineyards, it has an idyllic setting with views over to Faro de la Mola and the island of Ibiza. At night, the light of the lighthouse illuminates this gem of a property. A complimentary four seater mini cabrio car is included in your stay along with two bicycles. The house is divided into three levels. Central floor, ground floor and attic room. Central wing: entrance hall with guest bathroom, fully equipped American kitchen including Nespresso machine, separate laundry area with washing machine & dryer, an annex room, living room with tv, & library with table games. All have access to the garden. Two double bedrooms are on this level each with its own ensuite bathroom and one triple room with bathroom all with access to the outside. Ground floor: Triple suite complete with bathroom and sitting room with sofa bed. In the attic: one more bedroom with beautiful views of the garden. All beds are made comfortable and supplied with fresh linen & towels. The house has air conditioning, heating & wifi. Dine alfresco on the terrace which is equipped with a bbq, table and benches; perfect for watching the famous Formentera sunsets. Relax on the exquisitely decorated terrace overlooking the pool, perfect for a leisurely breakfast . The garden is filled with the calming aromas of rosemary and lavender. In the centre of the garden is a large swimming pool with Pergola, chill out area with tables and sofas, along with the relaxation area with loungers and cushions. Concierge service and daily cleaning is provided for your stay. This house is 2km from La Mola with many bars, shops and restaurants. 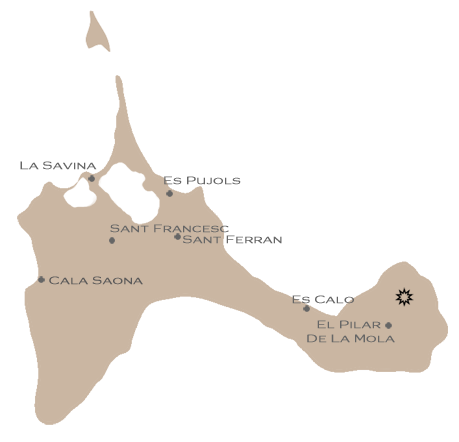 4km to the nearest beach Es Calo or Platja Mitjorn. The lighthouse of La Mola is a lovely cycle ride away.